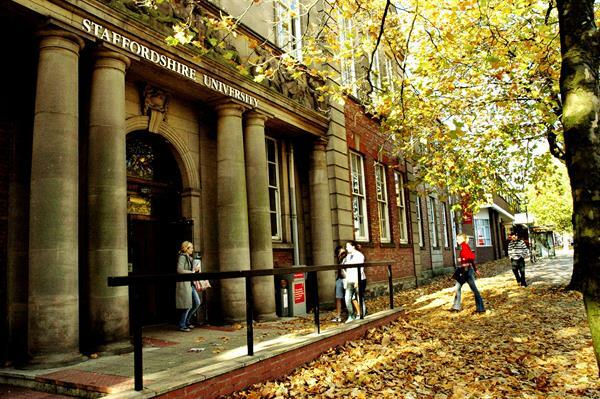 : BA (Hons) Acting and Theatre Arts programme, taught at the School of Film, Sound and Vision of Staffordshire University, is accredited by Drama UK and aims to provide students with knowledge and understanding of the key developments in theatre history, dramatic writing and theatre. It scored 100 percent in Overall Student Satisfaction in the National Student Survey 2013 and was ranked 39 out of 106 in Guardian league tables. This course is taught at the University's Stoke-on-Trent campus which has state-of-the-art technical facilities for productions as well as strong links with local theatres and arts organizations. The Acting and Theatre Arts programme allows students to explore a wide range of industry-based theatre disciplines, styles, methods, genres and approaches. Students are provided with enriching theatre visits to London, Stratford upon Avon and New York. Classes are taken by lecturers with extensive professional experience in acting, directing, lighting design, sound design, playwriting, production management, physical theatre and music theatre. The course curriculum includes core modules like Explorations in Acting and Performance, Theatre Production (and Scene Study), Theatre Practice and 20thCentury Drama & Theatre as well as optional modules such as Introduction to Theatre Directing, Music Theatre and Introduction to Stage Design. There are a variety of optional modules available in the third year so that students can choose a pathway suited to their strengths and career aspirations. There are no formal exams during the course and the assessment is done via presentations, coursework and take-away papers. : A student has numerous career options to choose from including Stage Managers, Lighting Designers, Actors, Directors, Technicians, Youth Theatre Leaders, Production Managers and Arts Administrators. : Applicants must have scored approximately 70% in Class 12. The University invites applications from those who have an interest in the creative process of drama or the performing arts. An overall IELTS score of 6.5is required. All applicants are individually assessed by a workshop entry. : Automatic merit scholarships worth £1,000 for the first year of study are available for all applicants who meet the entry requirements. For each subsequent year a student studies at Staffordshire they will receive a scholarship based on their end-of-year grades. Application Deadline: 31st March2016; students can apply via UCAS (the Universities and Colleges Admissions Service).